This EOYDC free community program consistently produces young record-breaking scholar athletes. Ashton Purvis: a senior from St. Elizabeth in California, was caught off guard initially when she saw Leon Powe walk into the class room at the East Oakland Youth Development Center on Wednesday morning. Trinity Wilson: a sophomore who was shooting for the Armory record in the 60 hurdles of 8.25, made a great recovery after a slow start and repeated as champion in 8.37. Wilson’s enroute time of 7.74 thru 55 shattered the national sophomore record of 7.81 that she tied in the semifinals on Saturday and is a US#1 this year for that distance. Ashton Purvis: looked ready to defend her sprint titles, blazing 7.52 in the 60m flat and 24.18 in the 200. 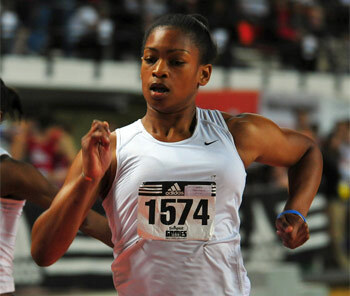 Ashton Purvis added two US yearly #1’s with 7.36 (60m) and 23.54 (200m) clockings in the sprints. Trinity Wilson: shocked with a lowering of her previous nation-leading 8.49 for 60m hurdles with a 8.44 clocking in flats. Trinity Wilson racing US prep history’s #4 60mHH ever at 8.29 that smashed the Soph US class record of 8.38 also. Ashton Purvis: World Youth Leader in the 100m with a time of 11.48 and is 4th in the world in the 200 with a time of 23.38. Lauryn Newson: Representing EOYDC finished 2nd in the Long Jump with a mark of 20′ 5″ 3/4 inches at the U.S.A. Track and Field Jr. (19 and under Championships); she will be representing the U.S. in the Pan American Junior Championships in Trinidad. 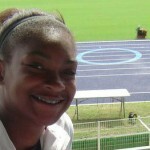 She was already the California Junior College State Champion in the 100m, 200m dashes as well as in the Long Jump. 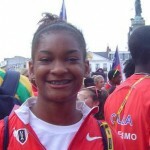 Trinity Wilson: Also representing EOYDC finished 2nd in the 100 meter hurdles with a time of 13.55 at the U.S.A. Track and Field Jr. (19 and under Championships); she will not be representing the U.S. in the Pan American Junior Championships in Trinidad. because she is too young even though she qualified by her placing. Trinity already holds the National Age 14 record of 13.77 for the 100 meter hurdles. Renee Williams: Outdoor Long Jump All American, Indoor Long Jump and 60m Dash All American, Indoor National Long Jump Champion, California State Long Jump Champion, Pan American Games Bronze Medalist in the Long Jump.